Thank you very much for your interest in becoming a puppy raiser or sitter for the Contra Costa East Guide Dog Raisers (CCEGDRs) on behalf of Guide Dogs for The Blind, Inc. (GDB). We hope that this page will answer some of the most frequently asked questions about puppy raising/sitting. The CCEGDRs is a non-profit organization of dedicated volunteers who raise, train, and socialize quality puppies for Guide Dogs for The Blind, Inc. of San Rafael, California. What are the requirements to become a puppy raiser/sitter? 1. Attendance at 4 consecutive puppy classes. 2. Completion of the puppy manual review. This usually takes about three sessions with the volunteer who completes the new raiser orientation. GDB supplies each raiser/sitter with a Puppy Raising Manual. The manual includes health information, training techniques, and policies related to raising a puppy. 3. Attendance at a graduation on the GDB campus in San Rafael either before or soon after you get your puppy or do your first official puppy sit. 4. Completed puppy application and associated paperwork. 5. One home visit by two of the group leaders. 6. Sit for a current puppy in training from the group for 2-3 nights. What breeds does GDB use? GDB uses four different breeds of dogs: black and yellow Labrador Retrievers, German Shepherds, Golden Retrievers, and the cross breed (lab and golden cross mix). What are the main responsibilities of a puppy raiser/sitter? We house train the puppies and teach them basic obedience. We socialize the puppies to acclimate them to all types of environments and to teach them how to behave appropriately in all environments. We train and socialize in restaurants, grocery stores, shopping malls, churches, theaters, and raiser/sitter places of work/school. We also expose the puppies to and ride all types of public transportation such as BART, buses, trains, ferries, and trolley/cable cars. 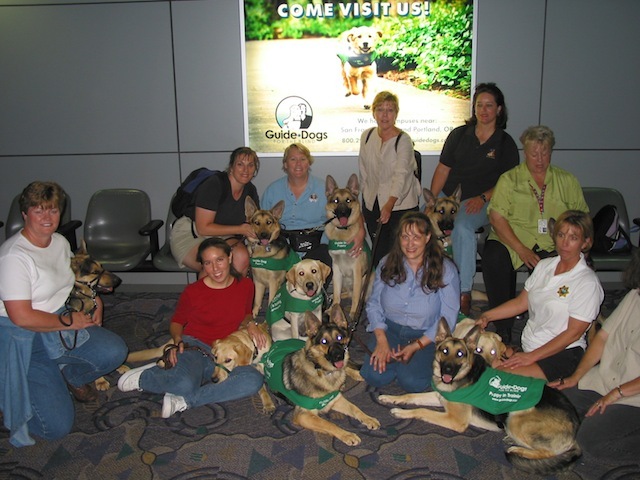 Puppy raisers/sitters also answer many questions and educate the public about GDB, blindness, and service dogs. Puppy raisers/sitters are crucial to the future success of a working guide dog. A puppy sitter is a volunteer who completes the same requirements as a puppy raiser. Puppy sitters are available to take a puppy for a short period of time when the raiser needs it for any reason. We start training all the puppies when they are 8 weeks old. A raiser usually keeps the puppy for 12 to 16 months. What happens to my puppy after 12 to 16 months of basic training and socialization? Your puppy is recalled (returned) to the GDB campus where the professional, licensed instructors do the formal training in guidework. What if I cannot make the 12 to 16 month commitment? A transfer puppy is puppy of any age that, for some reason, cannot be finished by the original raiser. The time commitment with a transfer puppy is shorter because the puppy comes to the new raiser as an older puppy. The time commitment depends on how old the puppy is when you get him before he completes the 12 to 16 months in the new puppy raiser home. How much does it cost to raise a puppy? What expenses does GDB cover? What expenses are the responsibilities of the raiser/sitter? It costs each raiser about $350 annually to raise a GDB puppy. GDB gives each raiser a $250 stipend to cover veterinary expenses. Should you decide to become a puppy raiser, the group leaders will discuss more detailed information about how veterinary expenses are covered in excess of $250. GDB will supply each raiser with the puppy coats, one nylon and one leather leash, small and large collar, medication for heartworm and flea protection, ear cleaning solution, one tie-down, and the first bag of dog food (5 lbs). The raiser supplies the specified dog food, toys, food and water dishes, and field trip expenses. Most, if not all, expenses related to raising a GDB puppy are tax deductible—please consult a tax professional regarding your deductions. CCEGDR has a supply of various sizes of crates (kennels) and other equipment (exercise pens, drag lines) that are available on loan to our puppy raisers/sitters. This helps defray raiser-associated costs. How often and where does the group meet? The CCEGDRs meet every Wednesday, normally at the Oakley Elementary School in Oakley. You will receive a monthly calendar, via email, with meeting locations, fieldtrips, and other necessary details. Please see the handout included in this packet for directions to the school. Puppies between 2 to 8 months of age must attend puppy class every Wednesday evening. Puppies between 9 to 16 months of age attend puppy class twice monthly. We ask that each raiser attends 80% of the puppy classes; however, we do not take attendance. We understand that emergencies and schedule conflicts do occur. We ask that raisers contact a leader if they cannot attend puppy class. We take the puppies on four field trips a year. All puppies are required to attend these field trips. Examples of field trips include taking the puppies on BART to San Francisco, exposing the dogs to farm animals, etc. The purpose of field trips is to expose the puppies to a variety of environments that they will encounter as working guide dogs. How is information communicated to the puppy raisers and sitters? We have found that the most effective way to communicate group information is by e-mail communication. We publish a confidential Group List of raiser and sitter contact information that is updated when changes occur. Once you become a volunteer for our group, your contact information will be included on the group list and you will receive a copy of it. We also communicate information at weekly puppy classes. Also, the leaders are always available by phone to assist raisers and sitters. Please contact a group leader if you are interested in becoming a volunteer for our puppy raising group! We hope that this F.A.Q. answers most of your questions about puppy raising/sitting. Please feel free to contact a leader if you have any other questions or if you are interested in becoming a puppy raiser/sitter. For more information about Guide Dogs for the Blind and the mission of GDB, please visit the website at www.guidedogs.com. We always enjoy talking to people about puppy raising and Guide Dogs for The Blind, Inc. We greatly appreciate your interest in us. Puppy classes are held in the gym at Oakley Elementary School in Oakley. The address to the school is 501 Norcross Lane. We normally meet at the school 3 times a month on Wednesday evenings from 7:00 p.m. to 8:00 p.m. (8:30 p.m. on the first Wednesday of each month). We normally have a community outing on the third Wednesday of the month. Alternative meeting locations are used when school in not in session. From Highway 4 in Oakley turn right (south) on Norcross Lane, approximately ½ mile after the Raley’s Shopping Plaza. From Highway 4 in Oakley turn left (south) on Norcross Lane, approximately 2 miles after passing through the older downtown area of Oakley. When facing the main entrance to the school, take the walkway to the left. Then take the short pathway to the right and go through the archway. The gym will be located just to the right. Please feel free to contact any of the leaders if you need more detailed directions or helpful hints in finding our meeting location.